and K C Somarathna – Managing Director, Somarathna Consultants. 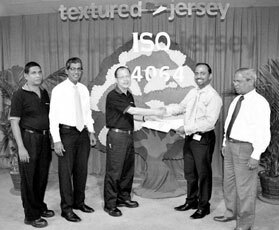 Textured Jersey Lanka PLC is the first manufacturing entity in Sri Lanka to embark on process improvements leading to compliance with the ISO 14064 environmental standard on reducing Greenhouse Gas emissions. Sri Lanka's pre-eminent producer of value-added knitted fabric recently entered into an agreement with Somarathna Consultants for technical advice and support for this initiative. The ISO 14064 standard provides businesses and other organisations with an integrated set of tools for programs aimed at measuring, quantifying and reducing Greenhouse Gas emissions and enables them to take part in emissions trading schemes using a globally recognised standard.